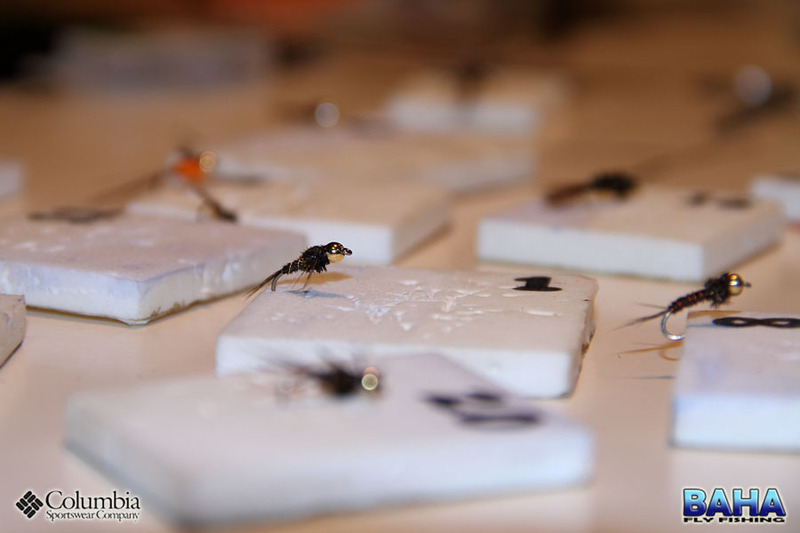 “Since past flies had been aimed mainly at salt water fish, trout and tigers I initially decided to tie a yellowfish fly. My first idea was therefore to tie the famous orange hotspot. Sadly however, with all the recent rains in Kwa-Zulu Natal, the rivers are a little high and muddy and yellowfishing has therefore taken a back seat. I therefore made a small change and decided to tie the Pheasant Tail Nymph, or PTN as it is commonly known. This fly works well for both trout and yellows, although I prefer to tie my trout version with a peacock hearl thorax while I tie my scally version with a dubbed orange thorax. I therefore provided materials for both giving people the option to tie either a trout version or a yellowfish version. 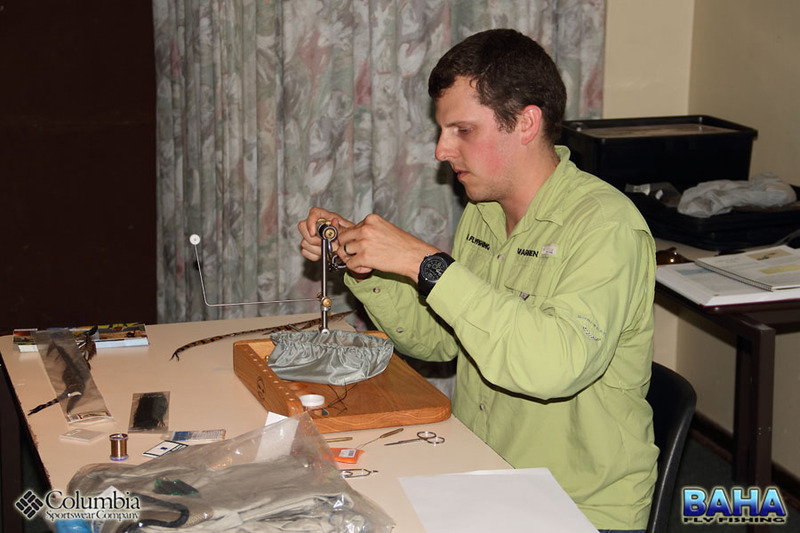 I also explained how to tie the fly with and without bead heads and how to weight it accordingly. Columbia Sportswear was kind enough to provide two prizes for the event, a PFG fly vest and a PFG ditch bag. These prizes were exceptionally well received and I must congratulate Bill Sadler for winning the bag and Nick Nortje for walking away with the fly vest. 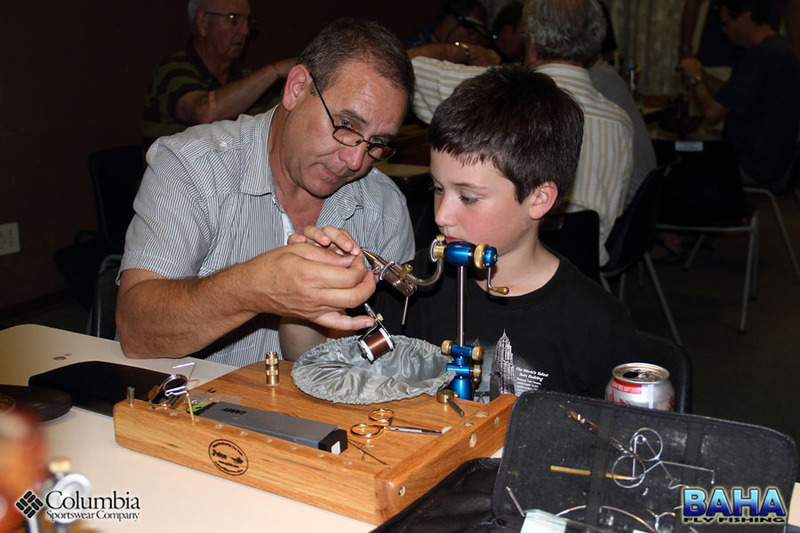 All in all the event was well supported and some great flies were tied by all who attended. Well done to our two winners; Tom Gifford tied the best senior fly and Kyle Hammond tied an exceptional fly to win the junior section. 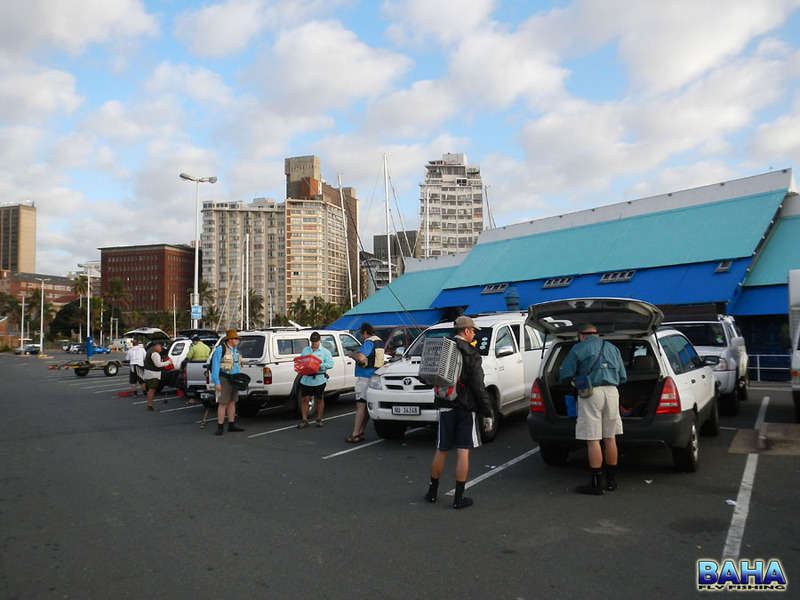 The 30th of September saw DFT head down to Durban Harbour. No less than 20 fly fishermen congregated in the Café Fish parking lot in eager anticipation to lay claim to the many species that can be caught in the Harbour. We made our way onto the banks at 6:30 to fish the pulling tide. Earlier in the week we had heard reports of a shark sighting, so the boys timidly walked knee deep onto the banks keeping an attentive eye out for this elusive shark. On arriving at the drop off we were greeted by a pod of dolphins smashing the fish we were about to target! All of us stood in awe as we watched them no more than 10 metres from us. The shark was no longer a concern. We have been fishing the bay for years and have never seen anything like that before. The conditions were perfect, a light puff from the NE, a pulling tied and a cool spring morning. The boys then spread themselves out across the bank from the block at Wilsons Wharf all the way to the Café Fish pier. 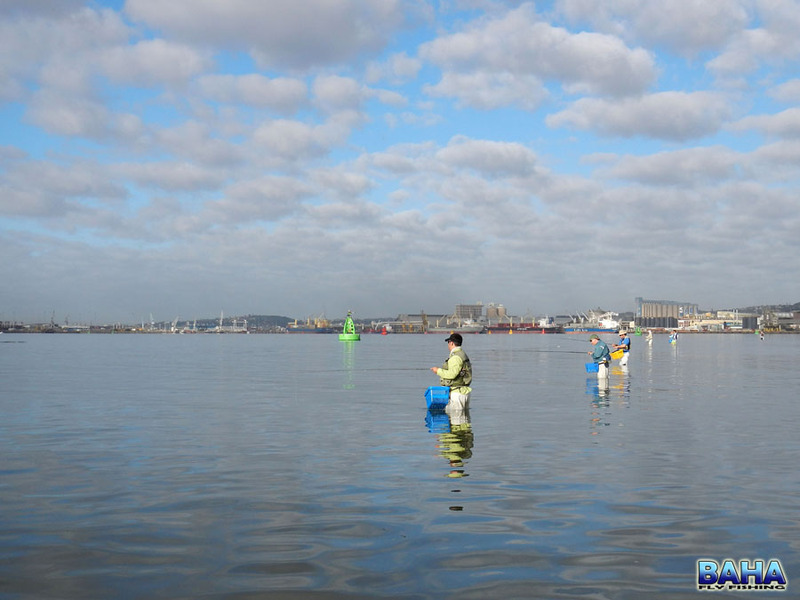 It was truly a fantastic sight to see the harbour laced with fly fisherman in all directions. It just a real pity that we don’t frequent the banks more often as it really is a great venue for a quick morning or evening flick. Walking up and down chatting to everyone I was pleased to hear that the guys were enjoying themselves and were happy to support the outings. A few gurneys were landed, but nothing worth writing home about as the bigger game fish were probably chased off by the pod of dolphins that came into the Harbour. At 10:00 we called it a day and retreated to Pirates Arms for a brekkie and beer before heading home to do the chores. A huge thanks to the DFT members for putting in the effort to attend these outings. Without you guys it would be pointless and it gives me great satisfaction seeing them turned into a success. It’s now time to get into some bigger fish! Our next trip will be the 28th of October. Details to follow.